"half the wealth of the continent is wasted in allowing the energy stored in the Great Lakes to run as waste through the Niagara River." For a number of years Alonzo C. Mather has held the idea that the rush of water in the Niagara River off the City of Buffalo can furnish a great deal of motive power. Many citizens of Buffalo had the same idea, and years ago they offered a prize of $100,000 for a practical method of utilizing this motive power, but nothing came of it. Mr. Mather did not hold out for the prize. He is a man of means, and he offered to test his idea himself, paying all the expense for such test, and finally, on top of that, if his scheme proves practical, to pay to the city a percentage of the revenue derived from it. Buffalo people have thought, pretty unanimously, that Mr. Mather should have a chance, because his offer is too good to throw away. Nevertheless, he has had a hard time in trying to get the opportunity to spend his money to test his idea. At least two Mayors, in previous years have formally approved a bill giving him power to experiment and practically all the organized business associations have supported it; nevertheless, the measure did not become law. But Mr. Mather did not give up. This spring the legislature passed the bill anew, and on May 9th Mayor Diehl signed it and sent it to Albany for final consideration by Governor Roosevelt. 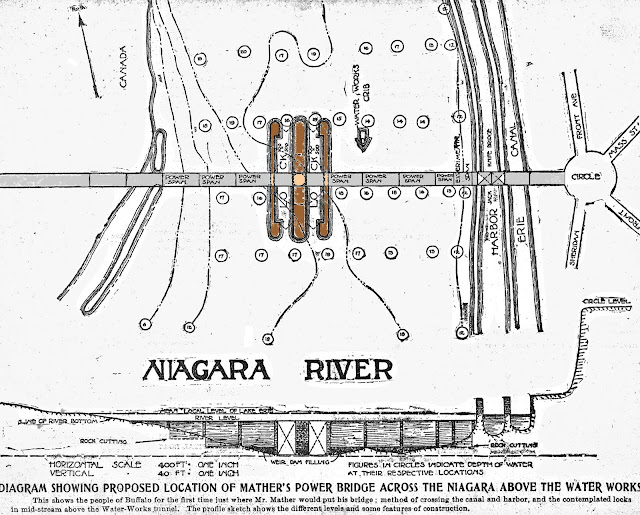 Mr. Mather's plan is that of a bridge, the spans of which shall support undershot waterwheels turned by the Niagara River. Bridge and wheel will each be of steel. 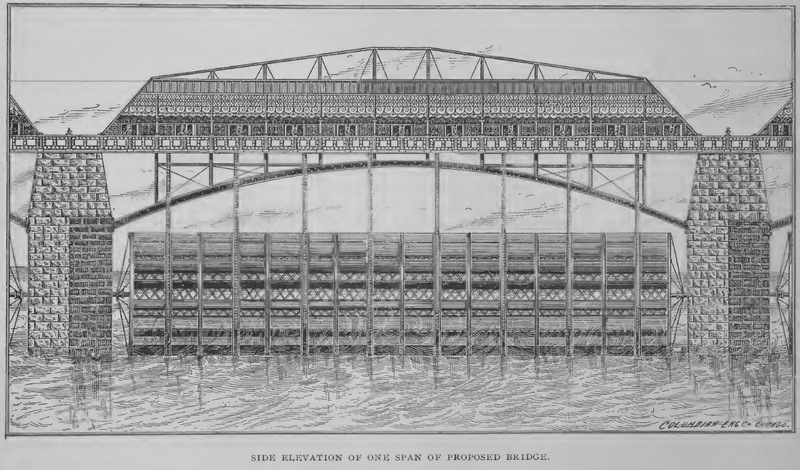 The total weight of a single span of the bridge would be 545 tons, and of the wheel 230 tons. On the bridge would be dynamos, run by belts from the wheels. Mr. Mathers purpose is to erect one experimental span, at the cost of at least $100,000. If that succeeds, he purposes to go on and build the remainder of the bridge. There would, of course, be a broad drawbridge at the channel of the river, and the wheels would be hung only in the spans at the sides of the river. Both bridge and wheels are expected to yield a revenue, according to his plan. The Mather Bridge, it will be seen, will not divert any water from the river. The wheels merely swing in the current, and the water that propels them passes on unabated in volume. The plans are subject to approval by the State Engineer and Surveyor and what is more important, of the War Department of the United States. Unless Mr. Mather is able to convince the War Department that the bridge will not obstruct navigation, he will be unable to go ahead. Not only are the plans subject to veto by the War Department, but the inventor is required to give a liberal bond as indemnification against possible damage to others. Five percent of the revenue from the bridge is to be devoted to the City of Buffalo. Alonzo C. Mather visited Buffalo eight years ago(1893). He walked along the parade grounds on the river front and observed a hurrying current of water rushing at the rate of eight miles an hour through a channel or millrace cut in stone by nature. To him it was a sight far greater than the Falls of Niagara, for he saw a vision of power bridges and great factories, bearing no smokestacks, lining the banks of the river. 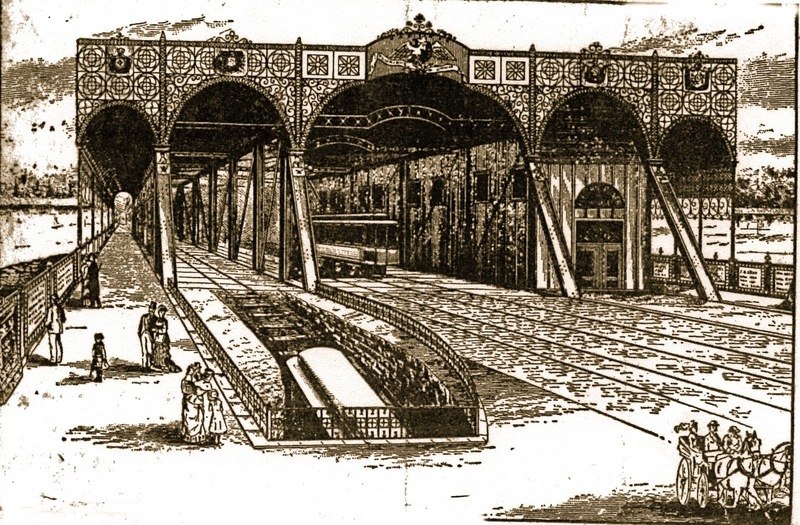 He believed then as he does now, that a body of water 100 times greater than that which destroyed Johnstown, which picked up locomotives and carried them great distances, could be harnessed by the hands of man. Mr. Mather is not a Buffalonian by birth, born at Fairfield, Herkimer County. He has been an inventor all his life. About 1874 he went to Chicago was successful in business and is the author of a number of profitable inventions. One that is pretty well known to Americans is the Mather Live Stock Car. A car designed for the safe and humane transport of livestock by railroad. 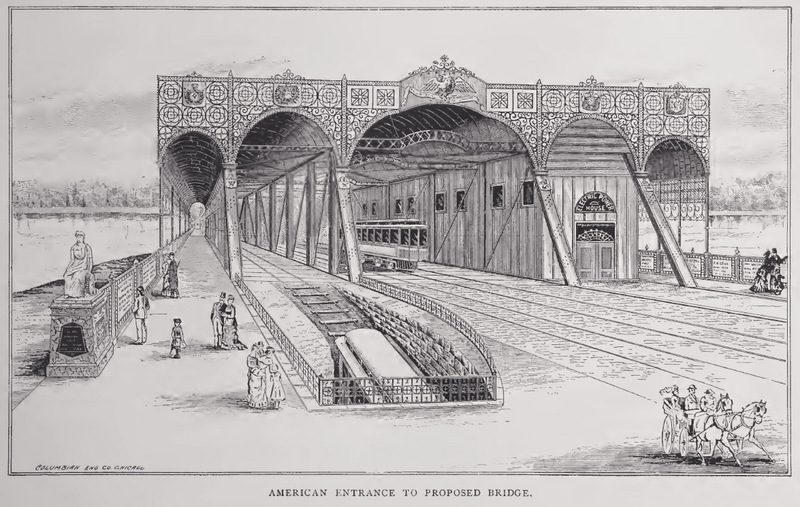 He decided though that the Mather Bridge should be his life work, and when he traveled to foreign lands afterwards, he made a point of studying the bridges and the current. "The principle of the bridge in a nutshell is the combined use of fixed pier dams, with fixed weir dams between the piers, together with power wheels acting as moveable water gates over the weir dam and between the piers; large locks being used to pass vessels from the level above the regulating structure, to the level below. The bridge as explained begins at the circle at the foot of Massachusettes Street, has a fixed span over the Erie Canal 65 feet above the water; next a jackknife draw over the so-called Black-Rock Harbor; next four 200 foot spans having their weir dams and power wheels there under; next a 400 hundred foot draw span, operating over two locks at the most navigable portion of the river. These locks are to be 500 feet long, and a fully 100 feet wide, in the clear, and big enough to pass steamers larger than any now in existence on the lakes, thus enabling steamers much larger than the Northwest or the Northland to run with safety to Tonawanda. After the locks and the draw span are three other power wheels, on the Canadian side, similar to those on the American side, making seven power spans in all. The fall of the river from the level of Lake Erie, to the proposed bridge site, taking an average with respect to all conditions of wind and an annual periodical fluctuation, is from two to five feet, and the volume of water flowing through the channel is such that it is capable of generating 66,000 horsepower for each foot of fall at the bridge, if there were located there a perfect mechanism for securing the same. If the wheels are lowered between the piers deep enough into the water, so as to just clear the weir dams beneath them, then the maximum horsepower would be obtained. 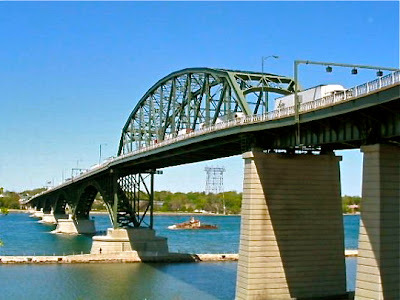 So that by varying the amount of load moved, or number of horsepower taken in connection with the wheels, the water above and below the bridge may be regulated, and the water in Buffalo harbor and other Lake Erie ports maintained at practically uniform depth, thus providing power production and river level regulation in one operation." 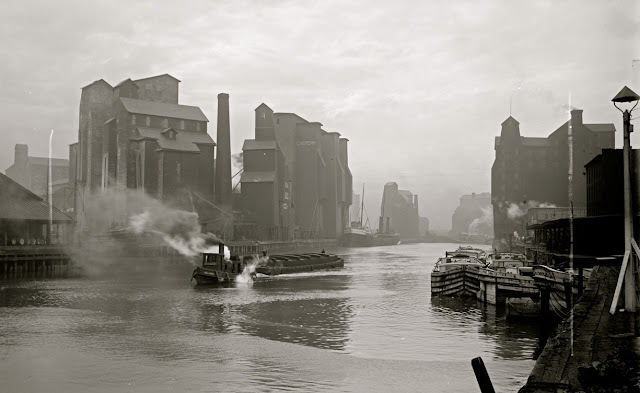 To provide approaches to his bridge power-plant, Mr. Mather obtained more than 100 acres of land on both sides of the river and won the approval of Canadian and Buffalo municipal authorities. As stated in the NY Times Jan 25, 1900 - The Mather Bridge Bill for the construction of an experimental span of a bridge for the generation of power over the Niagara River, which has been before the Legislature for eight years, was again introduced by Senator (William F.) Mackey today. It is understood that in its present form it is satisfactory to the Governor and likely to become law. Albany, March 27 1900 - The Mather Bridge Bill finally passed the Senate this afternoon... The bill was passed by a vote of 31 to 6 and now goes to Governor Roosevelt. Albany April 24 1900 - "What is the objection," inquired Governor Roosevelt, of having the experiment tried of seeing if the proposed span would develop power? If great power was developed, it seems to me, this would accomplish great good for Buffalo." April 25 1900 - MATHER BRIDGE BILL LAW - Governor Signs Mackey Measure - Governor Roosevelt prior for his departure for the West this evening, signed the Mather Bridge bill introduced by Senator Mackey, which will permit the Mather Power Bridge Company to build and maintain a power bridge over the Niagara river. 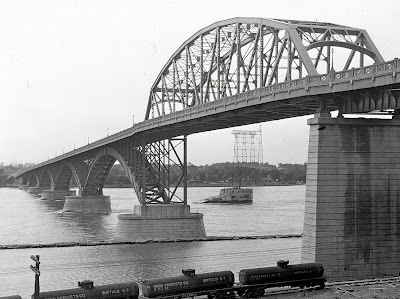 June 23 1902 - ...The Mather bridge has received the endorsement of many of Buffalo's most prominent citizens. Ex Mayor Jewett was one of Mr. Mathers first sponsors when the bridge project was brought forward by him for practical consideration. "There has been an apparent delay in the construction of the bridge but it is easily explained. The opposition to the bridge had to be shown that it was not inimicable to their interests and this has been demonstrated. I have delayed pushing this great work, also, because I knew nature would soon force the government to construct a great regulating dam at the head of the rapids in order to restore lake levels to where they formally were and guarantee the marine interests a regular and certain depth of water. This would mean the construction of a channel along the side of the river inside the breakwater, with the necessary locks, and thus the channel would be cleared. All this had been brought about in the last three years." "I am anxious to commence work and find out just what I have to contend with. All I require is the necessary permission from Congress and having got thus far I must not fail here. And even if my efforts are a total failure and my daydreams come to naught, no one is a loser except myself. I am not asking one dollar from anyone, although the experiment may cost $200,000 and require 3 or 4 years work of experiment." (Ed.) Mr. Mathers Bridge Bill had supporters in Congress and went to committee and sub-committee hearings in 1903. An irony of the main point of opposition to the bill is that it would be a hinderance to navigation on the river, yet the Federal government was making plans at the same time to build a dam across the Niagara River near Porter Ave. to control lake levels, and build a still water channel within the breakwater for ships to navigate to Tonawanda. Mather was willing to wait till the channel was built before he started on the actual bridge so the argument of "navigation" could be eliminated. In the end Alonzo Mather needed the approval of the War Department that the bridge will not obstruct navigation. In 1904 Major Theodore A. Bingham, U.S Engineer for the district was unalterably opposed to the project, not even wanting the experimental span which would have been removed at Mather's expense if it failed. He said, "I do not like to oppose publicly a project that has for it's object the furnishing of cheap power to this city, but this plan of Mr. Mather is so impracticable and will fall so far short of the object that it proposes to further, that I cannot for one consent to see it tried. The scheme is visionary, and I might say truthfully that it is absolutely idiotic." A few days later, Mather wrote a letter in the Buffalo Express under the headline "Weary, But Not Hopeless" rebutting Bingham's arguments once again. He was buoyed by the outpouring of support from the citizens, organizations and business associations in Buffalo, along with three mayors and four State Legislatures. "I fail to find in the United States a city that has not been benefited by bridges where they have been built, and there is no doubt if the money could be raised to build a bridge across the Niagara River within the limits of this city, it would be of great benefit, not only in bringing thousands of farmers and people from the other side to trade with, not withstanding the present tariff now amounts to a surprising sum, would be enormously increased by better communication. It would also give the people on this side quick and easy access to the country on the other. In fact, it is in the line of progress and bound to come and no power on earth can prevent in no distant day a bridge across Niagara within the limits of the City of Buffalo, the same as there are bridges everywhere where the growth of the country will justify the investment necessary for their construction and whenever they are put over navigable streams, provisions are always made for the free passage of vessels. ...(The Power Bridge)I believe will make Buffalo the electrical City of the United States as in no other place do just such conditions exist, and make a ready market for her real estate at what it is really worth, due to her unsurpassed natural advantages and having water power of her own right at her door." Editors Note: Alonzo C. Mather spent a large part of his lifetime exemplifying the spirit of good will between the United States and Canada. A former Buffalo resident, he owned considerable property in Canada, particularly in the vicinity of Fort Erie Ontario. 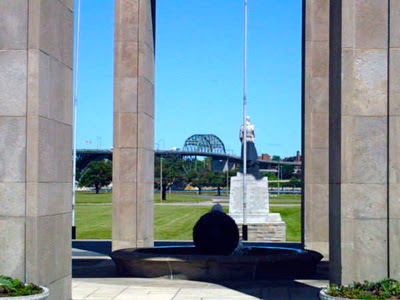 The park forming the Canadian approach to the Peace Bridge, was named Mather Park in his honor in 1940. He donated the 75 acres for the park and $30,000 for it's construction. Mather died Jan 5, 1941 in LosAngeles at the age of 92. Alonzo Mather, we need you! He was a "visionary" in the true sense of the word in 1893 and I only wish he could be here now in light of all the bridge schemes, lacking in the most fundamental energy devices, that have surfaced in the last few years. If he was here he would probably be appalled at the lack of vision in the design of the so-called "signature bridges" not taking advantage of the natural resources we have here to generate power. Electricity was in it's infancy then, and even Tesla's power plant at Niagara Falls was 3 years in the future when Mather saw a great potential right at Buffalo's doorstep. Especially now when we have more diverse technologies at our fingertips like wind, solar, thermo-electric and many types water generators at our disposal. It is an embarrassment to our generation of "green energy" enthusiasts to build a bridge that is not self-supporting energy wise. Think about it. There is an inexhaustible supply of fast moving water under the bridge; an unobstructed exposure to sunlight, and wind uninhibited by obstructions over the water. One couldn't have dreamed up a better scenario for energy generation! Yet all anyone can come up with is "just make it look pretty". You can design solar power into the bridge, wind energy generators that are aesthetically pleasing and various types of current generators in the water. When the sun goes down, the wind and water would work, and if the wind wasn't blowing the water would still be going under the bridge, and if the water wasn't going under the bridge ...well... then we probably have bigger problems to worry about anyways. A bridge will be "Signature" not because it's "pretty" (though it can be) but because it's practical. Not only making power for it's own use but selling excess back to the power companies. Throw in a fuel cell and thermo-electric generator for good measure and you will have a signature bridge unlike any other. Also, using LED lighting, an energy surplus would most certainly be guaranteed. The technology is here, USE IT! Buffalo's Steele MacKaye, the "Father of Modern Acting"
A Few Horns, A Head of Steam & We're Good! Hello, I have always been fascinated by Buffalo's history and disappointed at how little of it was being told. Especially in regards to the waterfront. Over the last 25 years I have conducted hundreds of tours for people from all over the world, both on foot and on the water. I am proud to say The Historic Buffalo River Tours have become a classic in this city. I created a museum, meeting place and lecture hall in my family's former restaurant the Harbor Inn on Ohio St. and conducted my walking tours from that location. I now take all of this to a new medium online to reach out further into the world. Hopefully these tours have spurred curiosity and respect about what was here, what is here, and what can be here in the future, and inspired those not afraid to see the possibilities.